Port Knocking is a technique used to secure connections or port access from unwanted users. 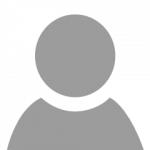 Using this technique we maintain one or more previously configured ports closed and these will only be opened using a sequence of requests to a number of ports that wepreviouslyset . To give an example , if we configure port Knocking access to port 50, this port will only be open when we make requests to the ports 1000,2500,3000 in that order , doing so, once we complete the sequence correctly the firewall will open the port that was previously closed.With this we add another level of security to certain types of connections to our server. 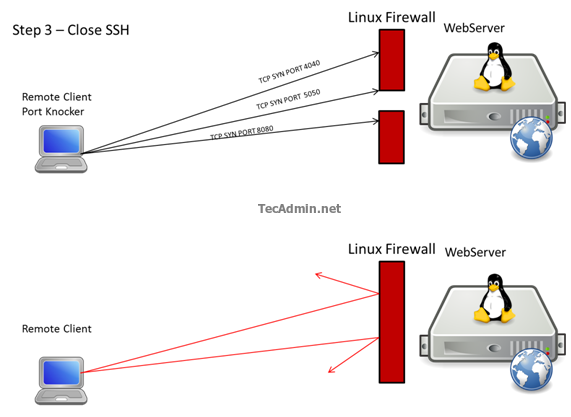 The client can perform the port knocking using Nmap, Telnet, or a tool for these purposes. 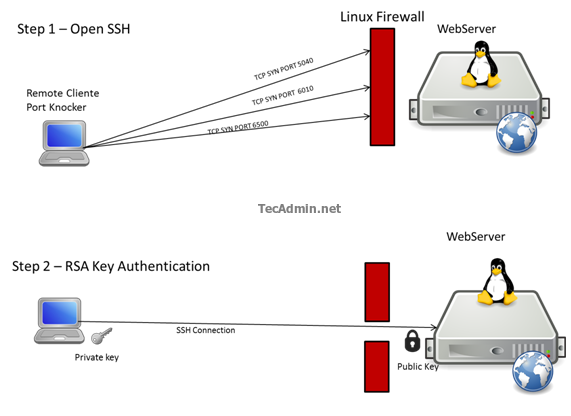 Let’s secure SSH connections using this method on a server running Linux CentOS . Follow the below steps as root. Before setting up the Knockd daemon, we must create an iptable rule the drops all connections to the SSH port , in this case we ‘ll use the default (22). Here to open the SSH port we will knock ports 5040,6010,6500 and when the sequence is completed correctly it will run a command that will add a rule in the firewall to allow the connection to our Linux Server via port 22 . We have another directive to close the port,Knocking ports 4040,5050,8080 it will run a command that will remove the Firewall rule that allowed us to do the connection via SSH. To Knock the ports you can use the tool Nmap or Telnet as follow. For this example we use nmap. I’m going to show a little more graphical . This is a brief representation of the process including authentication with RSA keys. hi, i did as you said, but that doesn’t work.